Pretty Hyacinths, and not all in a row. I think hyacinths are a bit difficult to place in the spring garden. Their upright racemes just beg you me to plant them like little soldiers all in a row. Indeed, I do have a row of hyacinths in the garden, along the edge of the border on the side of the house. Don't mock the row. Those hyacinths have returned reliably for probably ten years, if not longer. Many tulips don't come back after the first year, row or no row. 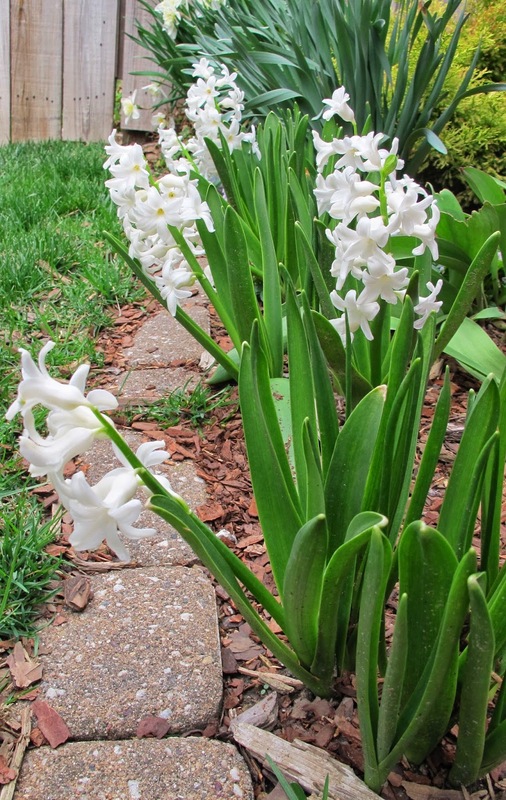 After ten years, I was bored by the row of hyacinths, mostly taking it for granted. I had also more or less decided I would only grow hyacinths indoors, forcing them into early bloom using hyacinths vases, or even planting them in a container. Once their blooms were spent, I'd toss them onto the compost pile. I would only by cheap big box hyacinths for this. My resolve weakened one day late last fall when I saw an end of the year bulb sale on the Old House Gardens website. 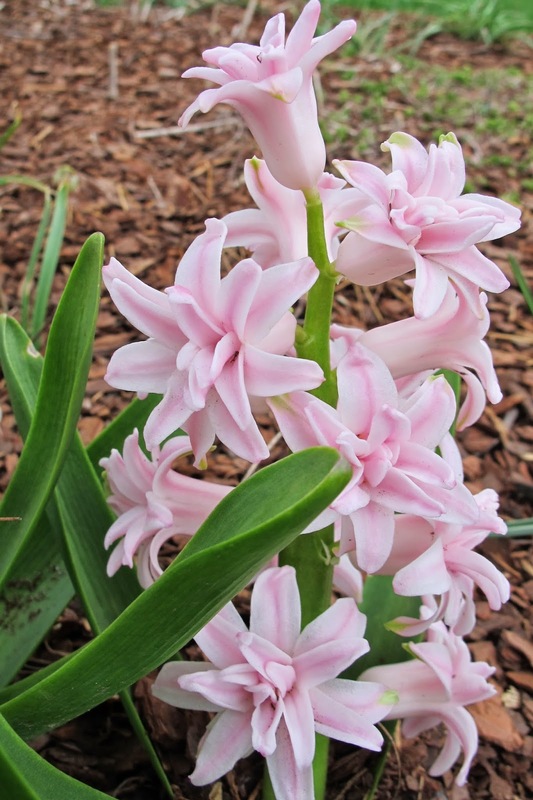 I broke down and purchased three bulbs of 'Chestnut Flower', a pink double-flowering hyacinth dating back to 1880. Once I got them, I decided I would plant them in the garden instead of forcing them to bloom indoors in the winter and then tossing them on the compost pile. I planted them in the garden border around the honeylocust tree, a border I call Birds' Blanket because the bird feeders are on the edge of this border. I chose this spot merely because they are pink and I only want pink and white flowers in that area in the spring. I also managed to plant these three bulbs in a triangle configuration, not a straight row. I'm pretty proud of that. Don't mock! Then I promptly forgot about them until this spring when they came up in the center of the border. They are the prettiest hyacinth I've ever seen. I took a few pictures of them yeterday. Would you like to see all the pictures I took? I will admit it looks a little odd to see these three hyacinths in the center of a larger border of flowers, most of which are just barely coming up. I think I'll mark where all the other flowers are, because many will bloom and die back. then this fall I'll buy some more hyacinth bulbs, all pink, to plant in this border. Yes, that's what I'm going to do. How could I not? 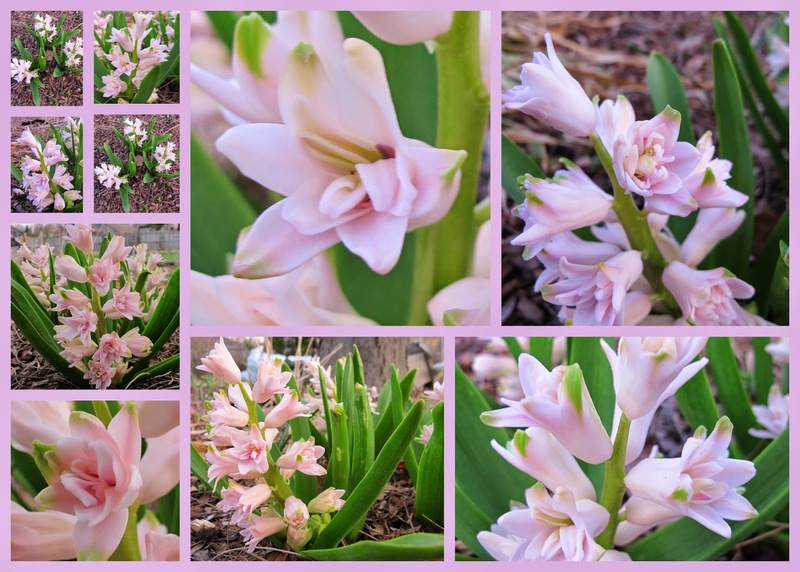 I do like your pink Hyacinth, and can understand you wanting more.They are difficult to place in the garden, I think that's why I grow most of mine in pots, although when in the garden they do seem to get smaller each year, then they blend in better with other plants. Thanks for the link to Old House Gardens. I ordered the Chestnut Flower Hyacinth and some daffodils to go with it in a border along my screen porch. The fragrance should be wonderful! Thank you for telling us about Old House Gardens! Congratulations on not planting in a row. Old habits die hard. But Frances of Faire Garden often plants in a line to great effect. But it's usually not a single row but more of a block following a line in the garden, such as a path or stairway. 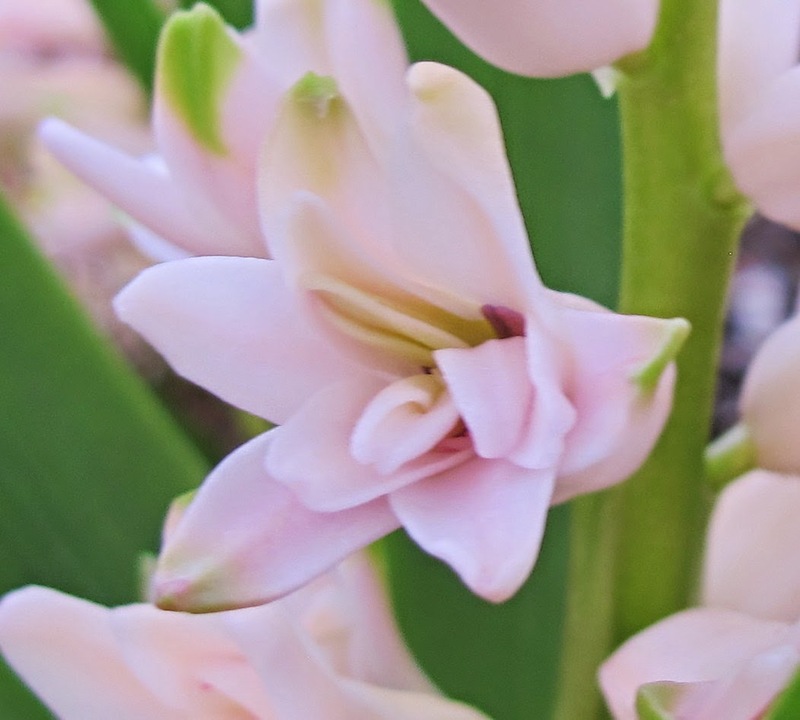 This is a beautiful hyacinth. I love pink - and Old House Gardens.